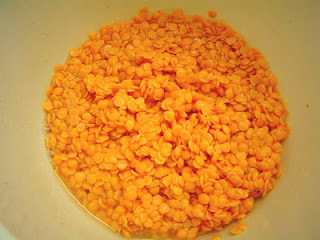 Wash and soak the dal in water for about 3 hrs. Slice the onion and finely chop the green chilli and keep aside. Once the daal soaked well, make a smooth paste of it in a mixer adding as little water as possible. Now to make the filling, heat oil in a pan and add the onions. Fry the onions till translucent. Add the ginger paste and chopped green chilli. Fry for another 2-3 mins. Now add the dal paste, chilli powder and salt. Ensure that the salt is a bit on the higher side as this would give a better taste to the puris. Cook till the dal is mixed well with the onions and all the water has evaporated. Do not cook it for too long as it’ll tend to make the filling very dry and hard to use later on. Now in a bowl, add the maida, salt and sugar and mix well. Then add the oil and evenly rub it into the flour. Now knead this flour with warm water and make it into a soft dough. The dough should be soft but not sticky. It’s easier to make stuffed puri if the dough is soft. Make smooth round balls of the dough first and then flatten them by appying pressure with your fingers and between your palm. Now place a ball of filling at the center and cover it with the dough. Ensure that the filling is in the center and the opening is sealed properly. Roll it between ur palm and flatten slightly. Repeat for the rest. Now grease a flat surface with a little oil and with a rolling pin, roll each of them into about 5” diameter round and ¼ cm thick. While rolling, the pressure should applied evenly and gently or else the filling may tend to come out of the puris. Heat oil in a pan and deep fry the puris one at a time. 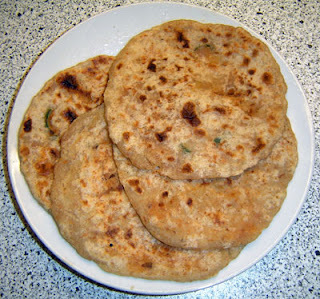 The puris would puff up once fried on one side. Flip and fry the other side for until slightly blown on each side. Please note, oil needs to be properly heated before frying the puris. Then again, if it gets too hot, then the puris would become too brown too soon. Hence, you need to regulate the temperature while you fry. 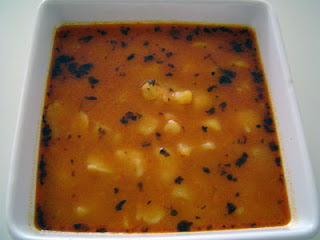 Serve it hot with Aaloo Sabji. *You may also use wheat flour instead of plain flour. In that case you need not add the oil in the dough. 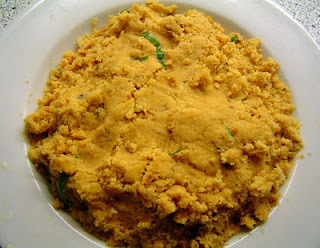 **If you do not want to deep fry, you may roast each puris on a flat pan. Once roasted, on both sides, add 1 tsp of oil and shallow fry them evenly. The picture above is of shallow fried puris. Boil the potatoes. Peal and crush them a little with your hands to get uneven pieces. In a pan heat the ghee. Add the kasoori methi and then the dhania, jeera, haldi, and chille powders. Add a little water and fry the masala for 2-3 mins. 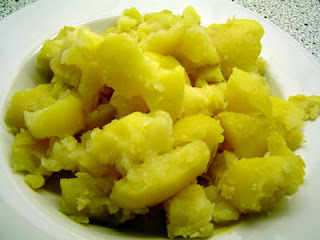 Then add the potatoes, salt and lastly the hing. Stir and add 2 cups of water. Simmer with covered lid for about 5 mins. Serve hot with kachori or puri or even chapati.